The Kemlo series is a collection of children’s science fiction novels written by Reginald Alec Martin, under the pseudonym of E. C. Eliott. 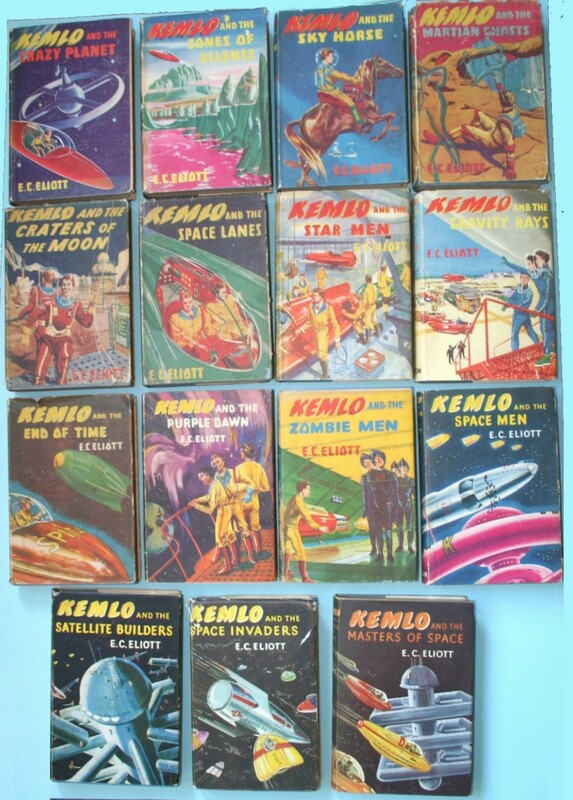 The first book, Kemlo and the Crazy Planet was published in 1954; the fifteenth and final book in the series, Kemlo and the Masters of Space, was published in 1963. The central character, Kemlo, was born and raised in space, on a satellite named Satellite Belt K (one of a number of similar space stations named after a letter of the alphabet). All children born on a space station were given names with the same initial, hence the names Kemlo, Kartin, Kerowski, Krillie, and so on. Kemlo was a Captain of the Space Scouts, who had their own “scooters” – small two-seat personal spacecraft for travel around and between the Satellite Belts. Kemlo, like all children born in space, breathed “plasmorgia” instead of air. This allowed him to breathe in space, although it meant he was unable to travel to Earth without the aid of compressed plasmorgia and “gravity rays”. This entry was posted in Space and tagged Kemlo, SciFi, Space. Bookmark the permalink.